WBC offers events exclusively for kids 12 and under between 9 AM and 9 PM in Fox Den between Monday and Saturday. Before any Junior may use the Juniors Room or participate in the Juniors Program, a parent or guardian must accompany the child to the Juniors Room to complete a consent form for the child. Among other items, this form provides contact information (e.g., cell phone number, hotel room number) to reach a parent in the event of an emergency. Only one form is required for the entire week. The games used in the Juniors competitions are usually the same as the ones the adults play—albeit sometimes modified to make them shorter or easier to understand. The emphasis is on sportsmanship—and discovering howmuch fun it is to interrelate with others with a good boardgame in this age of electronic eye candy. Although all Juniors events are Class C—Coached—and will be explained, it is best if the children have some advance familiarity with the games in question. Winners receive smaller versions of the plaques their parents are striving for in the adult competitions or other prizes. More than one child has returned home with more wood than adorns their parents mantle. In some cases, GMs provide additional, non-monetary prizes. Whenever possible, please send Juniors with copies of the games they will play in order to ensure that there are enough copies to allow everyone to play. This is particularly vital for Juniors events because many of the kids do not have games and our GMs cannot provide enough copies for everyone. BPA hires adult Juniors Room Monitors who have experience working with children who will supervise the Juniors room during Juniors hours. During 2016, they will be Laurie Wojtasczyk, Joanna Melton, and Crystal Shipley. Regardless, WBC and its monitors and its GMs assume no responsibility for keeping track of your child’s whereabouts before, during or after any Junior event. There is no substitute for parental supervision. Remember: This is not a day care service and children should be well-behaved and respectful of others. In addition, they are expected to exhibit good sportsmanship. Any child who behaves inappropriately will be asked to leave. At the discretion of the convention director and the Board of Directors, a child who has been removed for inappropriate behavior may be restricted from future Juniors competition or required to have parental supervision when playing in a Juniors event. WBC members and gaming companies have donated games to a Juniors Game Library. Juniors can check out these games for use in the Juniors open gaming area. Your donations to this library are appreciated. Contact juniors@boardgamers.org. If you’re looking for a way to “give something back” to the hobby, look no further than WBC’s Juniors Program. 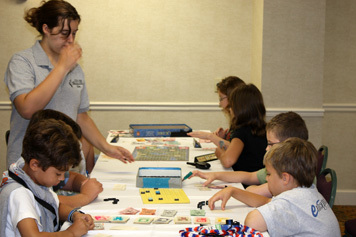 To help, contact Laurie Wojtaszczyk, the Juniors Program Coordinator, at juniors@boardgamers.org. GM volunteers are always needed to run events. Any boardgame of suitable complexity level and length is eligible for use in the Juniors tournaments. Assistants are always needed to teach games and supervise tournament tables full of youngsters. You’ll find that Juniors are enjoyable to game with. They often use innovative strategies and believe in using diplomacy for every move. You may find that the little time you spend in the Juniors Room is some of the most fun you have at the convention. (Don’t be embarrassed if an 8-year-old beats you soundly.) Please sign up ahead of time or on the sign-up sheets posted in the Juniors Room. Donate games to the Juniors Game Library or for a tournament (be sure the game is labeled with your name). Donate funds for expanding or improving the Juniors Program. We appreciate everyone who has contributed in any way to our Juniors Program. 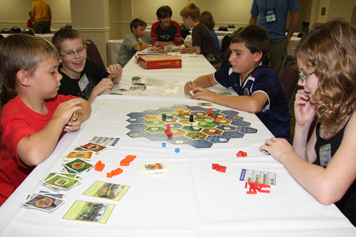 The following companies, clubs, and individuals—plus other anonymous donors—have contributed to creation of the BPA Juniors Game Library: Avalon Hill, Days of Wonder, Fantasy Flight Games, GMT Games, Northstar Games, Rio Grande Games, Out of the Box Games, Valley Games, Games Club of Maryland, Brian Sutton, David desJardins, Craig Yope, Days of Wonder, and Mark Yoshikawa. Seven Springs has a wide range of amenities for children and family entertainment as well as daycare. Check their website for details. Please be aware that Juniors who use the swimming facilities need to be supervised by someone over 16 years old. If you are seeking assistance with childcare, use the WBC pre-registration page to post your query.